OriGene Technologies offers a collection of polyclonal and monoclonal antibodies to members of the Aurora kinase family. These antibodies are thoroughly evaluated and suitable for Western blotting and immunohistochemistry methods, and also for other immunological applications, such as immunocytochemistry and immunoprecipitation. Zhou et al. (1998, PMID 9771714) found that Aurora kinase A is involved in the induction of centrosome duplication-distribution abnormalities and aneuploidy in mammalian cells. Centrosomes appear to maintain genomic stability through the establishment of bipolar spindles during cell division, ensuring equal segregation of replicated chromosomes to two daughter cells. 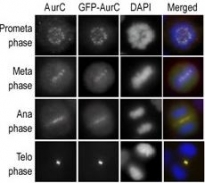 Deregulated duplication and distribution of centrosomes are implicated in chromosome segregation abnormalities, leading to aneuploidy seen in many cancer cell types. 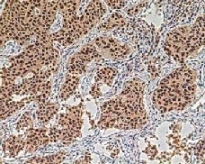 In addition, amplification of STK6 is demonstrated in approximately 12 % of primary breast tumors, as well as in breast, ovarian, colon, prostate, neuroblastoma and cervical cancer cell lines. High expression of STK6 mRNA is detected in tumor cell lines without evidence of gene amplification. Ectopic expression of STK6 in mouse NIH 3T3 cells leads to the appearance of abnormal centrosome number (amplification) and transformation in vitro. Finally, overexpression of STK6 in near-diploid human breast epithelial cells reveals similar centrosome abnormality, as well as induction of aneuploidy. Aurora kinase A is a key regulatory component of the p53 pathway, and overexpression of Aurora kinase A leads to increased degradation of p53, causing downregulation of checkpoint-response pathways and facilitating oncogenic transformation of cells. These findings suggested that AURKA is a critical kinase-encoding gene, whose overexpression leads to centrosome amplification, chromosomal instability and transformation in mammalian cells. This protein is a Ser/Thr protein kinase member of the Aurora subfamily that may be directly involved in regulating the cleavage of polar spindle microtubules, and is a key regulator for the onset of cytokinesis during mitosis. Aurora kinase B is localized to the midzone of the central spindle in late anaphase, concentrated into the midbody in telophase and cytokinesis, and is colocalized with gamma tubulin in the midbody. 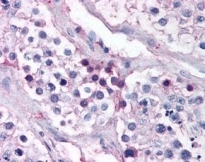 High levels of Aurora kinase B expression are seen in the thymus, although it is also expressed in the spleen, lung, testis, colon, placenta and fetal liver. Aurora kinase B is expressed during S and G2/M phase, and expression is up-regulated in cancer cells during M phase. This protein acts as a chromosomal passenger protein and forms complexes with Aurora kinase B and inner centromere protein (INCENP). Aurora kinase C phosphorylates histone H3 in vitro. INCENP binds and activates AURKC in vivo and in vitro, and AURKC co-expressed with INCENP elicits histone H3 phosphorylation of interphase cells. Using an in vitro kinase assay, Yan et al. (2005, PMID 15938719) found that AURKC-SV phosphorylates a test substrate protein, and its activity depends on Thr179. During cell mitosis, AURKC-SV associates with chromosomes in prophase and metaphase, and then transferred to the central spindle midzone and the cortex where the contracting ring forms during the transition from anaphase to telophase. It remains in the midbody during cytokinesis.